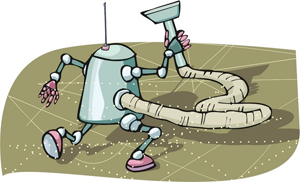 Just found a very interesting, very detailed article about keeping space robots / vehicles clean in terms of microbes: RYOT News » Scientists building robots focused on not contaminating Mars. The decontamination of spacecraft, an obscure arm of space science, has grown in importance as NASA turned its attention to places such as Mars, Titan and Europa that have environments that are potentially conducive to life. The spacecraft needs to be scrubbed so that when it impacts Mars, it is carrying no more than 500,000 spores of microbial life, so few they could fit on the head of a pin. The goal is simple, said Jakosky, a University of Colorado at Boulder professor: “Don’t contaminate Mars or jeopardize your science.” The trick is in the execution. The article even mentioned the Andromeda Strain which is pretty silly, but overall the article is very useful discussing how NASA and others try to keep their robots clean so they can be sent to Mars, Europa and other places with as little a microbial burden as possible. For more on microbes on spacecraft see our Mendeley collection and especially those tagged as being about space.